Elk are, without a doubt, the most majestic animal in the North American big game deer family and Alberta offers some of the finest elk hunting available anywhere. With Trophy Hunters Alberta, you can hunt Alberta for elk throughout the forested area leading into the eastern slopes of the Canadian Rockies and throughout the rolling foothills region in southern Alberta. THA currently has 44 elk allocations (about 10%) and a number of premium options for hunting elk both during the rut and in our late season elk hunts. For the serious elk hunter seeking a realistic hunting opportunity for Alberta elk, THA should be your outfitter of choice. 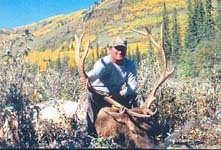 Please visit our Trophy Hunters Alberta Elk Photo Gallery for pictures of some of our successful elk hunters. With the high demand for hunting elk in Alberta, and the limited availability of tags in the province (due to strict Fish and Wildlife management of this species), THA recognizes the difficulty prospective hunters encounter when seeking to secure desirable placement for an upcoming season, particularly for groups. Although elk are, without a doubt, the most difficult species of ungulate to hunt, especially when they are being aggressively pursued, THA typically has a success ratio as good as, and usually better than, most other elk outfitters in the Province. Accommodation is typically on a working Alberta ranch, in a remote tent camp, a rustic remote lodge (complete with restaurant, store, satellite TV and other amenities) or in a local motel in a small town in, or near, the hunting zone. We offer both archery and rifle hunts. Our hunts start August 25 for the 'early season' (pre-rut) with the rut commencing mid September. During October there may be a 2nd and/or 3rd rut and then on October 25th we commence our 'late season' hunts until the end of November. THA's Archery Elk hunts take place in the forested area leading into the eastern slopes of the Canadian Rocky Mountains and the rolling foothills of southern Alberta. The 'early season' archery elk hunts occur just north of Rocky Mountain House (WMUs 326 and 330). The 'rut' archery elk hunts occur southwest of Calgary in the rolling Porcupine Hills. (WMU 304). THA's Rifle Elk hunts take place in the forested area leading into the eastern slopes of the Canadian Rocky Mountains and the rolling foothills of southern Alberta. The 'rut' rifle elk hunts occur around Rocky Mountain House (WMUs 326 and 330). The 'late season' rifle elk hunts occur in the Porcupine Hills southwest of Calgary (WMU 304). THA's prominence as the premiere elk and big game Outfitter in Alberta allows us to offer an excellent range of combination hunts in some of Alberta's finest big game elk hunting areas. We add both mule deer and/or whitetail deer to each of our elk hunts. In our experience, the elk rut generally starts about September 10 and typically runs until the end of the month. The second rut is less predictable and occurs during October, however, by this time the elk have been hunted hard, many bulls have been shot and the elk have become quite nocturnal hiding in the heavy timber. Elk can be the most difficult ungulate to hunt due to their incredibly wary nature, however, they are undoubtedly the most magnificent trophy in the deer family. Once spooked, they are not like deer, holding up in the next bush or draw, but rather they start running and may not hold up for 1 to 3 miles thus negating any pre-hunt scouting. Once elk are spooked, they become very nocturnal and require hard hunting to find where they have decided to settle down. Unlike our archery hunts, where we see elk most days, rifle elk hunts can be very unpredictable, especially once the elk have been hunted by rifle hunters. We include wolf & coyote hunting in all of our moose hunters. The odds of seeing a wolf are low in most areas, however, we usually harvest a few wolves each hunting season. All our Elk hunts are fully guided with 2 hunters per guide and are all-inclusive (airport service, guiding, accommodation, meals, rough caping & transportation during the hunt). There are no hidden, or surprise, charges and no trophy fees. One-on-one guiding is available on most hunts at an additional cost of $1,500/week. Also, non-hunters are welcome at an additional $1,500/week per person. To book your Elk hunt with Alberta's premiere big game outfitter, please phone us toll-free @ (877) HUNT-YES <(877) 486-8937>. We are also booking future year hunts at current prices. 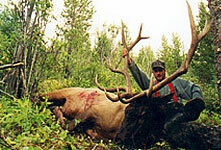 We also provide big game hunts for Mule Deer, Moose and Whitetail as well as numerous combination hunts. Please let us know if you would like more information on these other species hunts. Please phone or e-mail us today to secure your hunt. We are now booking hunts for future seasons at current pricing.